Today marks a historic moment in the life of our country. It is the 45th Anniversary of the Declaration of Martial Law by President Ferdinand E. Marcos. For those who have experienced its horrors, the possibility of its coming back in whatever form or expression is alarming. There are those who say that Martial Law is a relic of the past that should be laid to rest in the dustbin of history. The victims and their friends will not, however, allow us to forget Martial Law and its atrocities. The ghosts of the victims are haunting and are making a demand on us the living, to remember. By remember I don’t simply mean to recall a past, but to re-member the dismembered or the broken for the sake of healing and liberation. Our remembering of the 45th Anniversary of the Declaration of Martial Law has taken on an urgent and critical significance because there are “ominous signs” that we are drifting fast toward tyranny or authoritarianism. “The people never give up their liberties, but under some delusion,” warned Edmund Burke. “Today,” says a Huffington Post writer, “there is a specter haunting the democratic world, the specter of autocratic nostalgia (emphasis mine). With interest groups and oligarchs coopting democratic institutions, average citizens are desperate for a secular savior who will put an end to the dysfunction and insensitivity of everyday politics. The illusion of autocratic miracle— the misplaced belief that a strong decisive leader can single-handedly save a whole nation — has gained ground across the [world]… We are in many ways slipping into an age of global authoritarianism (emphasis mine).” When dreams are constantly betrayed, distressed populations are once again beginning to “lash out” their frustrations against the traditional ruling elites and have rallied around “strongman” figures, often offspring and supporters of former dictators that have skillfully filled in the power vacuum. We know the dangers when power is concentrated in the hands of the few. The greater the power is; the greater is the abuse. We must always be on guard against the abuse of power. In the lines of philosopher Nietzsche: “The pursuit of power makes [one] cunning, the possession of power makes [one] stupid.” Or, following Lord Acton, “Absolute power tends to corrupt, and absolute power corrupts absolutely.” Tyranny and corruption are bedfellows: they feed and nourish each other. On the other hand, it is also true that powerlessness corrupts and can be corrupted absolutely. When people are powerless, or when they feel powerless, they are more susceptible to any corrupt power. Impoverished by the corruption of the power wielders, the impoverished people participate in the very corruption that continues to impoverish them. 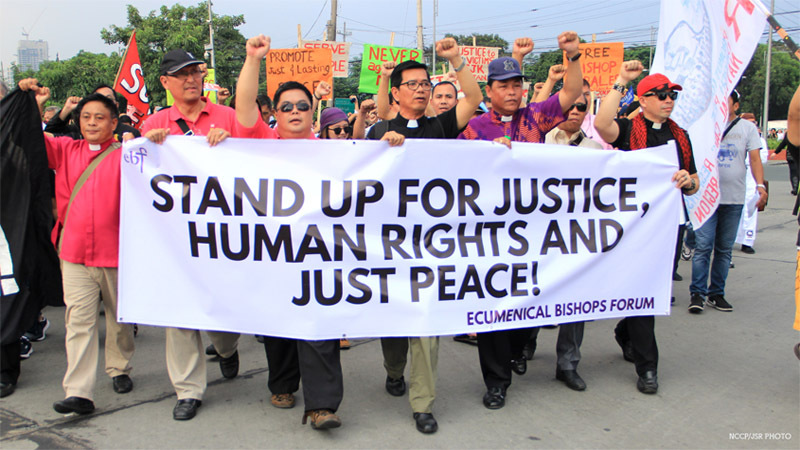 Sadly, this phenomenon of global authoritarianism is showing its ugly head in the Philippines. There are ominous signs that we are drifting fast toward tyranny. Yes, there are “ominous signs” that any decent and concerned citizen can see, hear, smell, and recognize. There are expressions of tyranny in the making and unfolding that any alert and vigilant citizen of the republic should not fail to notice. There is a deliberate marginalizing and silencing of any dissent, criticism, and opposition, through various ways and means. When you have this, you have signs of tyranny in the making. Social media, through the use of automated and paid human trolls, has been deliberately and effectively used to attack and humiliate dissenting voices. This online trolls is part of a “keyboard army” that the regime has mobilized to silence dissenters and to create an illusion of widespread public support. This is a sign of tyranny in the making. The killings of journalists, the militarization of the government bureaucracy, the threats of impeachment by complicit Congress, and the move to immobilize the Commission on Human Rights by giving it a measly budget, are signs of tyranny in the making. Making public statements that give total blanket support for police operations without much accountability, instigation of police violence, and inciting vigilante killings all in the name of a cause, such as war on drugs, are signs of tyranny in the making. Disregarding calls for thorough investigations of alleged police violence for the sake of not demoralizing police officers in the performance of their mission is a sign of tyranny in the making. When perpetrators continue to do their business as usual without any serious consequences of their actions, how do you call this situation? It is a situation marked by a “culture of impunity.” And when a culture of impunity reigns, we have the signs of tyranny in the making. Who benefits and who suffers from a “culture of impunity?” You know well the answer: It protects the powerful but hits most the poor and powerless because they lack the means to protect themselves. When impunity reigns, cynicism and demoralization invade the social life. The integrity of our whole political life is at stake. When integrity is compromised, people lose faith in the system, and all the more corruption, poverty, and criminality spread like cancer. Demoralization and cynicism produces a climate conducive to crime and graft and corruption. The vicious cycle continues. It is no wonder that criminality, poverty, and graft and corruption pervade our land. You must have heard of a political joke that has been circulating around. It said that when Pope Francis visited Sri Lanka, elephants greeted him. When he arrived in the Philippines, he was greeted at the NAIA by crocodiles. Our drifting toward authoritarianism cannot, however, be fully understood apart from the larger context and forces around us. Wherever we see violation of human rights in the most pervasive, sophisticated, and systemic ways, we see the interest of predatory capitalism at work. Wherever we see large-scale plantation (banana, pineapple, palm oil, etc), logging, and mining interest at work, we see militarization, repression, and extrajudicial killings. Because the areas of indigenous peoples are often the targets of developmental aggression, it is not a surprise that many indigenous people have become victims. It is in this context of demoralization, cynicism, and desperation that is conducive to crime that desperate people are all the more vulnerable to false promises and panaceas, including the leadership of heroic-strongman figures to liberate them from their sorry mess. We can observe the rise of populist-authoritarian leaders around the world, all stoking the fears of the desperate and threatened multitude. Sadly, many of our intellectuals, both in the church and the wider society, have succumbed to the lure of autocratic nostalgia, because of their desire for autocratic miracle. They have forgotten that nostalgia is often sweeter than reality. They have let their intellectual and prophetic guards down because of their desire to fast track change in the name of a noble cause. When the church does not fully conform to their thinking, they criticize the church as irrelevant. But, what is a noble cause when, in the process, we sacrifice our own children. How many “collateral damages” can we allow in the name of noble objective? Is it one, two, three, a thousand, or a million? But even one is far too many. Every life is sacred; every life counts. We are in the midst of a deep crisis or, to change the metaphor, a deep darkness. The darkness around us is deep, but it seems that we don’t get it. Following William Stafford’s lines: [Like elephants, we] parade holding each [others] tail,/but if one wanders, [our] circus won’t find the park,/I call it cruel, and maybe the root of all cruelty/to know what occurs but not recognize the fact.…… For it is important that awake people be awake,/or a breaking line may discourage them back to sleep;/the signals we give—yes or no, or maybe—should be clear: The darkness around us is deep. Are our signals clear? Yes, no, or maybe? Remember, the darkness around us is deep. There comes a time when we must say, Tama na! Sobra na! Stop now! Never again! We must say this, loud and clear! “All tyranny needs to gain a foothold is for people of good conscience to remain silent,” says Edmund Burke. There is only one element left for a dictatorship to reassert itself in our country: the people’s silence or apathy. Silence may momentarily protect us, but not forever. We may have thought that we can run morally scot-free by remaining silent. No, not at all. To paraphrase the theologian José Comblin, silence is a lie when truth needs to be spoken. So, beloved community, let’s raise our anguish and voices to the heavens and public places of our land. True, the large majority is still silent and, sadly, this is true of many churches. 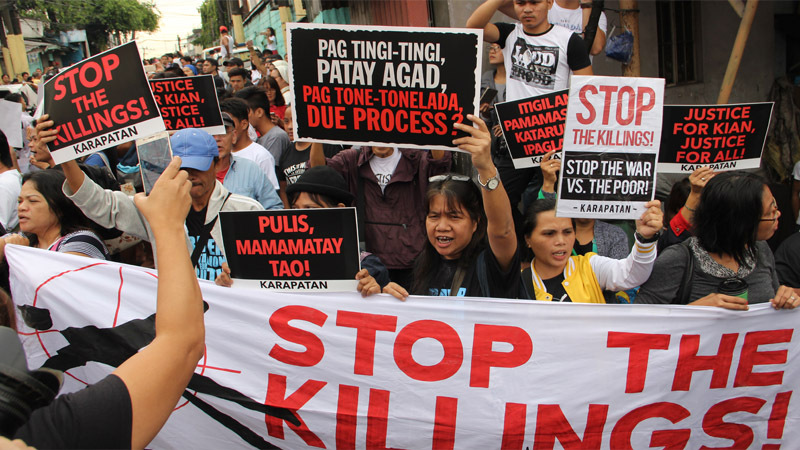 Nonetheless, even as the number of victims grows each day, the cries and protests of the people are also getting louder and mightier. The people are slowly gaining back their courage. Courage is not the absence of fear, but is founded on the belief that there is something greater than fear, in which fear itself cannot hold us back from pursuing. Courage does not deny the danger, but demands a full recognition of what is to be feared. But it is precisely at this point when, in the lines of Annie Dillard, “we start feeling the weight of the atmosphere and learn that there’s death in the pot,” that is, when we learn what really is to be feared, that the atmosphere is ripe for the birth of courage. Knowing what is to be feared can paralyze us, but courage refuses to let that happen. Courage comes from the often-neglected side of knowledge. In courage we know not only what is to be feared, but also what is to be dared. What is to be dared is human dignity in the face of its desecration and violation; what is to be dared is the just and democratic society in the face of corrosion to its very core; what is to be dared is the sanctity of life that is terrorized by the forces of death. These are reasons to dare, and dare we must! But there is something more that courage requires us to dare and to do. The fate of the victims will remain sealed in the graveyard, and the new tomorrow will not dawn on us, if we do not transform our knowledge of what is to be feared and what is to be dared into people’s movements. Daring to transform our knowledge of what is to be feared and what is to be dared into a movement is both crucial and urgent. The Gospel demands it, and the victims are also demanding it of us, the living. The fate of the victims or the dis-membered is not sealed in the graveyard but is tied to our daring acts of re-membering. Those who “died before their time” have a future as well as those who are “yet to come,” but that declaration of faith is tied to the way we live our lives now and to our embodiments of transforming movements in the present. There is a time to mourn and wail for our losses. But it is not enough. Where do I see seeds hope? I see seeds of hope among those who have claimed their voices and have taken the courage to speak truth to power. I see seeds of hope in the groaning, greening, socially conscious, and empowered people who have decided to join the organized and mobilized multitude to make our socio-political institutions serve the common good. I see seeds of hope among those who have raised their voices to the highest heaven, Never again to Tyranny! Rev. Dr. Eleazar S. Fernandez.PhD is a professor of Constructive Theology . 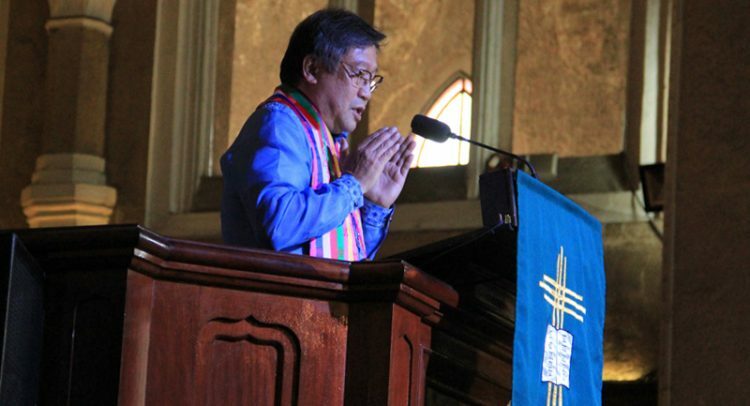 He is an ordained minister of the United Church of Christ in the Philippines and the current President of Union Theological Seminary of the Philippines.